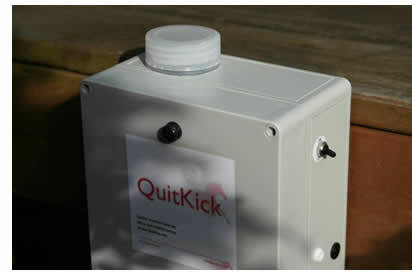 QuitKick has been designed to stop horses kicking their stable doors. It does so 100% effectively and very quickly. However, before fitting QuitKick it is important that you have attempted to understand the reasons behind why your horse is kicking. A regular routine and exercise are vital for any horse. You may find implementing these two things is enough. Also not rewarding the horse by giving it any 'treats' to stop the kicking will undoubtedly help. Boredom can also be a key factor in door kicking. Where possible attempts should be made to offer the horse as much mental stimulation as possible. Information on 'enriching' your horses environment can readily be found on the internet. Whilst QuitKick WILL stop your horse kicking the stable door it is very important the welfare of the horse is not overlooked. Since QuitKick has been available it has stopped many horses from injuring themselves and in some cases has literally saved their lives. However it is not designed to be a substitute for good caring horsemanship.